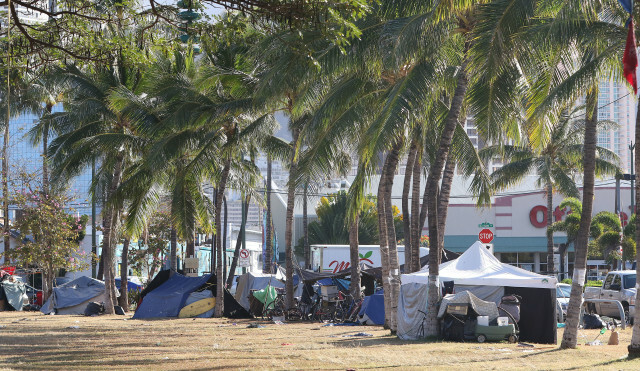 (AP) — Safety concerns brought on by an estimated 180 homeless people living along the shoreline has prompted an indefinite closure of Kakaako Waterfront Park, park officials said. Park officials can no longer ensure the safety of park users following a recent series of dog bites, fires and vandalism attributed to the homeless people, said Jesse Souki, the executive director of the Hawaii Community Development Authority. The park will be closed starting Sunday night. Kakaako Gateway Park and Kewalo Basin will also close Sunday for the same reason. Homeless encampments have been an issue in the Kakaako parks for years. Souki said authorities will sweep the estimated 120 hardened encampments the night of closure. Homeless outreach workers have already begun the process of letting illegal campers know there is space at shelters on the island. Souki estimated that fixing the damages brought on by the encampments could cost nearly $500,000. There is no timetable for when the parks will reopen, but Souki said he hopes to at least have Gateway Park open in a month.